Two short (~20 minutes each) goofy FMV choose-your-own-adventure games where you must help Awkward Steve navigate mildly-difficult social situations. In the first game, A STRANGER COMES CALLING , the doorbell rings while Steve isn’t expecting any visitors. Your goal is to reduce Steve’s anxiety to the point where he is willing to answer the door. You can choose between a variety of activities, some of which will help Steve relax and some of which will backfire and make him more anxious. 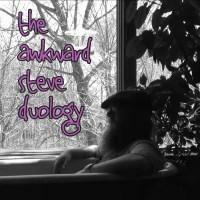 Most of the appeal comes from just how silly or surreal Steve’s antics are as he navigates awkward versions of everyday tasks. You can unfortunately reach dead-ends that essentially force you to restart, but you can double-click to skip scenes you’ve already seen and quickly get back to new choices. It’s short enough that the novelty doesn’t outstay its welcome and the ending does not disappoint. The second game, DON’T TURN YOUR BACK ON THE OCEAN , has Steve trapped in the bathroom while his roommate throws a party. There’s no anxiety meter to manage, no clear goal apart from passing time, and a much more linear flow as most choices either have no effect or immediately kill Steve and prompt you to pick something else. The overall effect is that instead of helping Steve overcome a challenge, you’re just along for a story of things happening to him. The ending comes out of nowhere and seems to be going for pathos, but Steve’s world is so nonsensical this time around that it’s impossible for it to resonate emotionally. While both games have some great moments, I found A STRANGER COMES CALLING to be a much more coherent and enjoyable package. When I finished A STRANGER COMES CALLING , I was happy I’d helped Steve overcome his anxiety. When I finished DON’T TURN YOUR BACK ON THE OCEAN , I didn’t feel much of anything. I Stopped Playing When: I finished both games and have gone back to see some alternate paths I missed the first time.